An analogy: I remember reading that in the job market, good talent is hard to find. The people who are amazing are often already working for companies that make an effort to keep them happy. If something makes them dissatisfied, they have networks of people who have been trying to recruit them for years. So, when the opportunity to connect with, help out, or hire an amazing person comes up, you should take advantage of it. I think good people might be like that too. I suspect there are way more good people than are on my radar, like the way that someone may not be a good fit for what you’e looking for but amazing for something else. Still, there are people whom I find it easy to resonate with. They rarely need help, so it’s good to be able to help them when they need it. There are some things I need to keep in mind. Supporting people shouldn’t get in the way of my self-care or equanimity, or interfere with more important relationships. (No sense setting yourself on fire to keep someone else warm, as some communities on Reddit say.) I can help, but I may need to remind myself that I can’t take responsibility for other people’s problems. At best, I can help them with scaffolding to make it easier for them to develop their own solutions. And it can’t be always an outgoing flow, getting people past the negative stuff; I should see a future where they’re on their feet, exploring things that inspire and engage me. They shouldn’t become dependent on me, and I shouldn’t become accustomed to being needed or encourage that. So, if I can help while keeping healthy boundaries, I think we can make this work. But if I take responsibility for managing my self-care and I work out good communication protocols, it might work out. I might even be able to use the Ben Franklin Effect in an unusual way. By helping people, I may grow to appreciate them more. It’s good for me too. It means being able to respond to the pull of shared humanity, helping people past rough patches so that they can move on and learn more. Besides, my Evil Plans could benefit from strong bonds with good people, not that people are instrumental or that those evil plans are well-formed or anything. And it’s good to see people triumph. 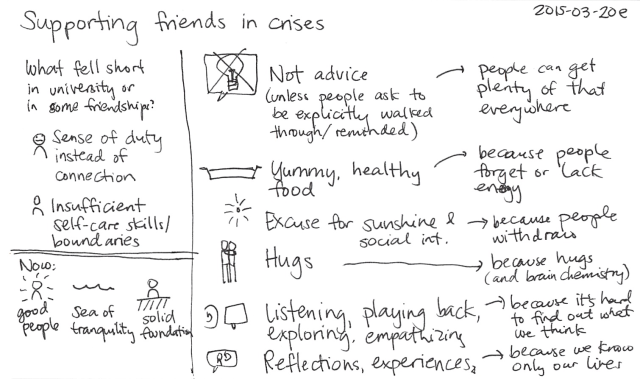 So, what can I do to help people who are going through difficult times? Help them with basic needs: People often neglect their need for good food, rest, and social interaction. I can cook more and drop off frozen meals, or they can visit me and we can make a relaxing afternoon of it (especially if I can drag them out for a walk in the park too). Give them hugs: Because people don’t get enough hugs, and brain chemistry can be a powerful thing. Listen to them and play back what I hear: Lots of people aren’t as used to untangling thoughts on paper or on their computer, so it can help for them to talk through what’s on their mind. If I take notes, that makes it easier for them to reflect on things later. 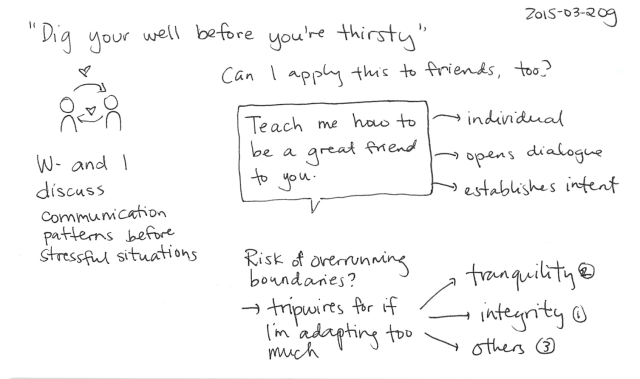 Share reflections, experiences: Because sometimes it helps to hear about other approaches and considerations. Sit with people or check in with them as they solve their own stuff: Good for people who know what they need to do, but who might appreciate an extra boost in motivation, enthusiasm, and progress-tracking. Hmm. 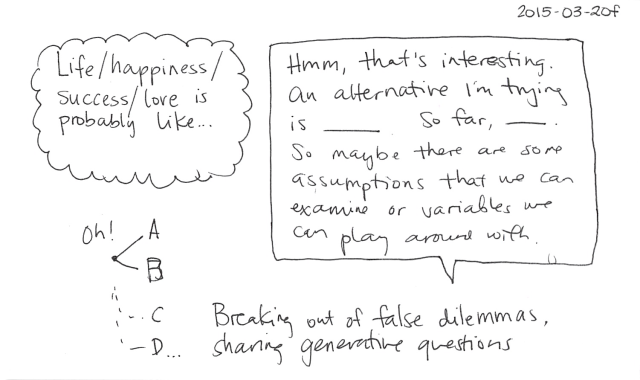 I’ve given reflections and alternatives a lot of thought, so it may sometimes be helpful to share these processes, tools, and generative questions with other people in case they want them. Not solutions, but ways to come up with your own solutions. That might be handy. Do I have a kind approach for dealing with situations that need more from me than I can give? It’s a responsibility I should consider before offering support, because it could turn into an additional rejection. There have been situations when people wanted support but I wasn’t in the right place to give it, or the resonance wasn’t there. Hmm. I haven’t really tried the second or third approach before. They feel more truthful to me, although it will take some learning in order to do them well. 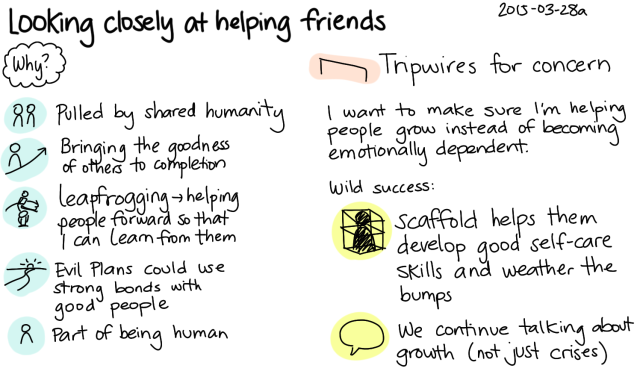 But if my goal is to be able to sustainably develop strong connections with good people who may (as all people do!) go through both tough and awesome times in their life, and since I will also go through both tough and awesome times in my life, I think that having this kind of communication about communication might be interesting. At the end of the day, to have people you can trust implicitly, whom you know so well and are so used to thinking with that you can look at situations in your lives with many people’s eyes, and yet whom you can count on to not injure or sacrifice themselves because of something they think you think you want – who will push back if needed and find a better way, and who expect the same of you – I think that might be wonderful.